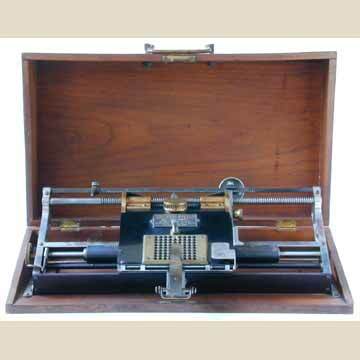 The Boston model, produced roughly between 1889 and the later 1890s, was the last of the Hall typewriters. This version of the Hall has a rectangular name plate and a black steel cover plate. The machine presented here still has the original rubber type in place (pic 5). This 1890 picture from the Manufacturer and Builder magazine shows the Hall in use, with a unique accessory: a roll of paper. 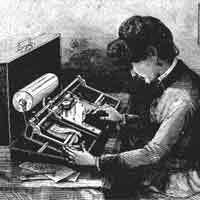 This way of typing on rolls of paper went out of fashion until it was rediscovered by beatnik writer Jack Kerouac in the 1950s. Do note that the Hall typewriter in this picture is larger than life. 19th century illustrations often depict machines out of proportion, probably to show more details. This has led to confusion among collectors who believe that these larger models exist. In fact, all Hall production models were the same size. The outside measurements of the wooden case are 21x39x10 cms.